Antus Odiil is the younger son of Valus Odiil. They were recently chased off their farm near Chorrol by goblins, and you will need to help him and his brother Rallus fight them off. Antus is a slightly less capable fighter than his brother, but makes up for it with his fighting spirit. He says he likes the thrill of a fight, and boasts about his fighting capacities after the goblins have been dealt with. If you manage to keep them both alive, their father will reward you with the leveled blade Chillrend. Once his related quest is finished, the family farm will once again be safe and he will promptly move in. He sleeps from midnight to 6am in the farmhouse, and has a two-hour meal at 10am. The rest of the time he can be found either wandering around inside or helping to work the farm. Antus wears a set of lower class clothing consisting of a dark green shirt, laced leather pants, and a pair of stitched leather shoes. 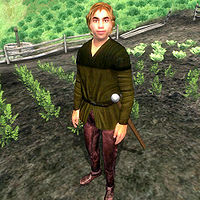 He is armed with an iron longsword and carries the key to Odiil Farm along with a small amount of gold. He does not exist in the game until you are on the relevant quest, at which point he appears before Weynon Priory. Antus is very proud of his father, and he'll express this through dialogue. He'll say: "He's the best fighter you'll ever meet, and as soon as he gets here, we'll be off. Just wait; you'll see. "; then "What do you mean he's not coming? He told YOU to come with us instead? Has he no honor?" Once it's all over, he'll say: "Father will be so proud of us... but I wish he'd been here." When you finish the brawl with the goblins, if he survived, he will proudly say: "Ha ha! We beat them! We slaughtered them all! Did you see? Did you see how well I fought?" This page was last modified on 21 August 2015, at 21:11.